This article is about the actor. For other uses, see Vincent Price (disambiguation). 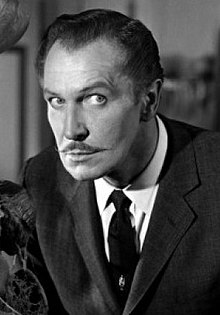 Vincent Leonard Price Jr. (May 27, 1911 – October 25, 1993) was an American actor best known for his performances in horror films, although his career spanned other genres, including film noir, drama, mystery, thriller, and comedy. He appeared on stage, television, and radio, and in more than 100 films. He has two stars on the Hollywood Walk of Fame, one for motion pictures and one for television. He was born and raised near St. Louis, Missouri and has a star on the St. Louis Walk of Fame. He was an art collector and arts consultant with a degree in art history, and he lectured and wrote books on the subject. The Vincent Price Art Museum at East Los Angeles College is named in his honor. He was also a noted gourmet cook. Price was born in St. Louis, Missouri, the youngest of the four children of Vincent Leonard Price Sr. (July 30, 1871 – June 18, 1948), president of the National Candy Company, and his wife Marguerite Cobb (née Wilcox) Price (October 28, 1874 – September 12, 1946). His grandfather was Vincent Clarence Price who invented "Dr. Price's Baking Powder", the first cream of tartar–based baking powder, and it secured the family's fortune. He was also a descendant of Peregrine White who was born on the Mayflower while it was in Provincetown Harbor. Price attended the St. Louis Country Day School and Milford Academy in Milford, Connecticut. In 1933, he graduated with a degree in English and a minor in Art History from Yale University, where he worked on the campus humor magazine The Yale Record. After teaching for a year, he entered the Courtauld Institute of Art in London, intending to study for a master's degree in fine arts. Instead, he was drawn to the theater, first appearing on stage professionally in 1934. His acting career began in London in 1935, performing with Orson Welles's Mercury Theatre. In 1936, Price appeared as Prince Albert in the American production of Laurence Housman's play Victoria Regina, which starred Helen Hayes in the title role of Queen Victoria. Price As Mr. Manningham in Angel Street, in which he played from Dec. 1941 to Dec. 1942, photo by Carl Van Vechten, 1942. Price started out in films as a character actor. He made his film debut in Service de Luxe (1938) and established himself in the film Laura (1944), opposite Gene Tierney, directed by Otto Preminger. He played Joseph Smith in the movie Brigham Young (1940) and William Gibbs McAdoo in Wilson (1944) as well as Bernadette's prosecutor, Vital Dutour, in The Song of Bernadette (1943), and as a pretentious priest in The Keys of the Kingdom (1944). His first venture into the horror genre, for which he later became best known, was in the Boris Karloff film Tower of London (1939). The following year Price portrayed the title character in The Invisible Man Returns (a role he reprised in a vocal cameo at the end of the horror-comedy spoof Abbott and Costello Meet Frankenstein released in 1948). Price reunited with Tierney in Leave Her to Heaven (1945) and Dragonwyck (1946). There were also many villainous roles in film noir thrillers like The Web (1947), The Long Night (1947), Rogues' Regiment (1948) and The Bribe (1949), with Robert Taylor, Ava Gardner and Charles Laughton. His first starring role was as conman James Addison Reavis in the biopic The Baron of Arizona (1950). He did a comedic turn as the tycoon Burnbridge Waters, co-starring with Ronald Colman in Champagne for Caesar (also 1950), one of his favorite film roles. He was active in radio, portraying the Robin Hood-inspired crime-fighter Simon Templar in The Saint, which ran from 1947 to 1951. In the 1950s, Price moved into more regular horror film roles with the leading role in House of Wax (1953) as a homicidal sculptor, the first 3-D film to land in the year's top ten at the North American box office. His next roles were The Mad Magician (1954), the monster movie The Fly (1958) and its sequel Return of the Fly (1959). That same year, he starred in a pair of thrillers by producer-director William Castle: House on Haunted Hill (1959) as eccentric millionaire Fredrick Loren, and The Tingler (also 1959) as Dr. Warren Chapin, who discovered the titular creature. He appeared in the radio drama Three Skeleton Key, the story of an island lighthouse besieged by an army of rats. He first performed the work in 1950 on Escape and returned to it in 1956 and 1958 for Suspense. 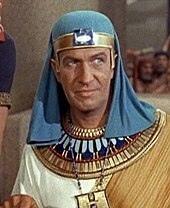 Outside the horror realm, Price played Baka (the master builder) in The Ten Commandments released in 1956. About this time he also appeared on NBC's The Martha Raye Show. In the 1955–56 television season, he was cast three times on the religion anthology series Crossroads, a study of clergymen from different denominations. In the 1955 episode "Cleanup", Price portrayed the Reverend Robert Russell. In 1956, he was cast as Rabbi Gershom Mendes Seixas in "The Rebel", and as the Rev. Alfred W. Price in "God's Healing". In the 1960s, Price achieved a number of low-budget filmmaking successes with Roger Corman and American International Pictures (AIP) starting with the House of Usher (1960), which earned over $2 million at the box office in the United States and led to the subsequent Edgar Allan Poe adaptations of The Pit and the Pendulum (1961), Tales of Terror (1962), The Comedy of Terrors (1963), The Raven (1963), The Masque of the Red Death (1964), and The Tomb of Ligeia (1964). He starred in The Last Man on Earth (1964), the first adaptation of the Richard Matheson novel I Am Legend and portrayed witch hunter Matthew Hopkins in Witchfinder General (US: The Conqueror Worm, 1968) set during the English Civil War. He starred in comedy films such as Dr. Goldfoot and the Bikini Machine (1965) and its sequel Dr. Goldfoot and the Girl Bombs (1966). In 1968 he played the part of an eccentric artist in the musical Darling of the Day, opposite Patricia Routledge. In the 1960s he began his role as a guest on the television game show Hollywood Squares, becoming a semi-regular in the 1970s, including being one of the guest panelists on the finale in 1980. Price made many guest-star appearances in television shows during the decade, including Daniel Boone, F Troop, Get Smart, The Man from U.N.C.L.E., and Voyage to the Bottom of the Sea. In 1964, he provided the narration for the Tombstone Historama in Tombstone, Arizona, which is still in operation as of 2016. He also starred as the host of the Australian TV series If These Walls Could Speak, in which a short history of a historical building (supposedly narrated by the building itself) was covered, and as the narrating voice of the building. During the early 1970s, Price hosted and starred in BBC Radio's horror and mystery series The Price of Fear. He accepted a cameo part in the Canadian children's television program The Hilarious House of Frightenstein (1971) in Hamilton, Ontario on the local television station CHCH. In addition to the opening and closing monologues, his role in the show was to recite poems about various characters, sometimes wearing a cloak or other costumes. Price appeared in The Abominable Dr. Phibes (1971), its sequel Dr. Phibes Rises Again (1972), and Theatre of Blood (1973), in which he portrayed one of a pair of serial killers. That same year, he appeared as himself in Mooch Goes to Hollywood, a film written by Jim Backus. He was an admirer of the works of Edgar Allan Poe and in 1975 visited the Edgar Allan Poe Museum (Richmond, Virginia), where he had his picture taken with the museum's popular stuffed raven. Price recorded dramatic readings of Poe's short stories and poems, which were collected together with readings by Basil Rathbone. In 1975, Price and his wife Coral Browne appeared together in an international stage adaptation of Ardèle which played in the USA as well as in London at the Queen's Theatre. During this run, Browne and Price starred together in the BBC Radio play Night of the Wolf first airing in 1975. He greatly reduced his film work from around 1975, as horror itself suffered a slump, and he increased his narrative and voice work, as well as advertising Milton Bradley's Shrunken Head Apple Sculpture. Price's voiceover is heard on Alice Cooper's first solo album Welcome to My Nightmare from 1975, and he appeared in the corresponding TV special Alice Cooper: The Nightmare. He starred for a year in the early 1970s in the syndicated daily radio program Tales of the Unexplained. He made guest appearances in a 1970 episode of Here's Lucy, showcasing his art expertise, and in a 1972 episode of ABC's The Brady Bunch, in which he played a deranged archaeologist. In October 1976, he appeared as the featured guest in an episode of The Muppet Show. excerpt from the voiceover session for the 1982 album. In 1976, Price recorded a cover of Bobby "Boris" Pickett's "Monster Mash" as a 45rpm single, putting his voice to a backing track laid down in London by record producers Bob Newby and Ken Weston. It was released on both sides of the Atlantic later that year without much success. In 1977, he began performing as Oscar Wilde in the one-man stage play Diversions and Delights, written by John Gay and directed by Joe Hardy and set in a Parisian theatre on a night about one year before Wilde's death. The original tour of the play was a success in every city except for New York City. In the summer of 1979, Price performed the role of Wilde at the Tabor Opera House in Leadville, Colorado, on the same stage from which Wilde had spoken to miners about art some 96 years before. He eventually performed the play worldwide. Victoria Price stated in her biography of her father that several members of Price's family and friends thought that this was his best acting performance. In 1979, Price starred with his wife in the short-lived CBS TV series Time Express. In 1979, he hosted the hour-long amusement park and roller coaster television special "America Screams", riding on many of the roller coasters himself and recounting their history. During 1979–1980, he hosted the "Mystery Night" segment of the radio series Sears Radio Theater. In 1982, Price provided the narrator's voice in Vincent, Tim Burton's six-minute film about a young boy who flashes from reality into a fantasy where he is Vincent Price. He appeared as Sir Despard Murgatroyd in a 1982 television production of Gilbert and Sullivan's Ruddigore (with Keith Michell as Robin Oakapple). In 1982, Price provided the spoken-word sequence to the end of the Michael Jackson song "Thriller". In 1983, he played the Sinister Man in the British spoof horror film Bloodbath at the House of Death. He appeared in House of the Long Shadows with Christopher Lee, Peter Cushing, and John Carradine. He had worked with each of those actors at least once in previous decades, but this was the first time that all had teamed up. One of his last major roles, and one of his favorites, was as the voice of Professor Ratigan in Walt Disney Pictures' The Great Mouse Detective in 1986. From 1981 to 1989, Price hosted the PBS television series Mystery! In 1985, he provided voice talent on the Hanna-Barbera series The 13 Ghosts of Scooby-Doo as the mysterious "Vincent Van Ghoul" who aided Scooby-Doo, Scrappy-Doo, and the gang in recapturing 13 demons. He was a lifelong fan of rollercoasters, and he narrated a 1987 30-minute documentary on the history of rollercoasters and amusement parks including Coney Island. During this time (1985–1989), he appeared in horror-themed commercials for Tilex bathroom cleanser. In 1984, Price appeared in Shelley Duvall's live-action series Faerie Tale Theatre as the Mirror in "Snow White and the Seven Dwarfs", and the narrator for "The Boy Who Left Home to Find Out About the Shivers". In 1987, he starred with Bette Davis, Lillian Gish, and Ann Sothern in The Whales of August, a story of two sisters living in Maine facing the end of their days. His performance in The Whales of August earned the only award nomination of his career: an Independent Spirit Award nomination for Best Supporting Actor. In 1989, Price was inducted into the St. Louis Walk of Fame. His last significant film work was as the inventor in Tim Burton's Edward Scissorhands (1990). In 1992, Price recorded the narration for Disneyland Paris's Phantom Manor, but the narration was shortly removed and replaced with an narration entirely in French by Gérard Chevalier. But they had left in Vincent Price's infamous laughter as a tribute to Price. However, in 2018, it was announced that during the renovation, they will be adding back Price's narration into the attraction. Price, who studied Art History (along with English) at Yale University, was an art lover and collector. He was a commissioner of the Indian Arts and Crafts Board. In 1957, impressed by the spirit of the students and the community's need for the opportunity to experience original art works first hand, Vincent and Mary Grant Price donated 90 pieces from their private collection and a large amount of money to establish the Vincent Price Art Museum at East Los Angeles College in Monterey Park, California, which was the first "teaching art collection" owned by a community college in the United States. They ultimately donated some 2,000 pieces; the collection contains over 9,000 pieces and has been valued in excess of $5 million. Price also spent time working as an art consultant for Sears-Roebuck: From 1962 to 1971, Sears offered the "Vincent Price Collection of Fine Art", selling about 50,000 fine art prints to the general public. Works which Price selected or commissioned for the collection included works by Rembrandt, Pablo Picasso, and Salvador Dalí. Public access to fine art was important to Price, who, according to his daughter, Victoria, saw the Sears deal as an "opportunity to put his populist beliefs into practice, to bring art to the American public." Price amassed his own extensive collection of art and, in 2008, a painting bought for $25 by a couple from Dallas, Texas was identified as a piece from Price's collection. Painted by leading Australian modernist Grace Cossington Smith it was given a modern valuation of AU$45,000. Mary and Vincent Price present a National Treasury of Cookery was a five-volume series, packaged in a boxed set and published by the Heirloom Publishing Company. These five books were combined into a single book two years later and published as Mary and Vincent Price's Come into the Kitchen Cook Book: A Collector's Treasury of America's Great Recipes. Most of the Prices' cookbooks remained in print throughout the 1970s. After being out of print for several decades, two of their books were reprinted; A Treasury of Great Recipes (in August 2015 by Calla Editions) and Mary and Vincent Price's Come into the Kitchen Cook Book (in November 2016 by Calla Editions), both featuring new forewords by their daughter Victoria Price. Cooking Price-Wise with Vincent Price is scheduled to be reprinted by Dover Publishing in October 2017 under the updated title Cooking Price-Wise – The Original Foodie. In 1971, Price hosted his own cooking program on British TV, called Cooking Price-Wise produced for the ITV network by Thames Television which was broadcast in April and May 1971. This show gave its name to Price's fourth and final cookbook later that year. Price promoted his cookbooks on many talk shows, one of the most famous instances being the November 21, 1975 broadcast of The Tonight Show Starring Johnny Carson, when he demonstrated how to poach a fish in a dishwasher. Price recorded a number of audio cooking tutorials titled International Cooking Course. These were titled Bounty of Paradise, Classical Spanish Cuisine, Cuisina Italiana, Delights from the Sultan's Pantry, Dinner at the Casbah, Dining at Versailles, Exotic Delights from the Far East, Food of the Gods, Foods from the Austro-Hungarian Empire, La Cocina Mejicana, The Bard's Board and The Wok. In addition to those, he recorded an audio wine course titled Wine Is Elegance. These audio recordings were released on 33⅓ LPs by Nelson Industries in 1977 and were also packaged in a twelve-cassette boxed set titled Beverly Hills Cookbook – Cookbook of the Rich and Famous, Your Host Mr. Vincent Price. In August 1982, he co-hosted A Taste of China for Britain's Thames Television/ITV over five episodes. He also prepared a fish recipe on Wolfgang Puck's Cooking with Wolfgang Puck VHS, released in October 1987 by Warner Home Video. Price married three times. His first marriage was in 1938 to former actress Edith Barrett; they had one son, Vincent Barrett Price, and divorced in 1948. Price married Mary Grant in 1949, and they had daughter Victoria Price on April 27, 1962, naming her after Price's first major success in the play Victoria Regina. The marriage lasted until 1973. He married Australian actress Coral Browne in 1974, who appeared as one of his victims in Theatre of Blood (1973). The marriage lasted until her death in 1991. Price denounced racial and religious prejudice as a form of poison at the end of an episode of The Saint, which aired on NBC Radio on July 30, 1950. claiming that Americans must actively fight against it because racial and religious prejudice within the United States fuels support for the nation's enemies. He was later appointed to the Indian Arts and Crafts Board under the Dwight D. Eisenhower administration; he called the appointment "kind of a surprise, since I am a Democrat." He was supportive of his daughter when she came out as a lesbian, and he was critical of Anita Bryant's campaign in the 1970s. He was an honorary board member of PFLAG and among the first celebrities to appear in public service announcements discussing AIDS. His daughter has said that she is "as close to certain as I can be that my dad had physically intimate relationships with men." Price suffered from emphysema, a result of being a lifelong smoker, and Parkinson's disease; his symptoms were especially severe during the filming of Edward Scissorhands, making it necessary to cut his filming schedule short. His illness also contributed to his retirement from Mystery! in 1989. He died of lung cancer on October 25, 1993, at UCLA Medical Center at the age of 82. His remains were cremated and his ashes scattered off Point Dume in Malibu, California. The A&E Network aired an episode of Biography the night following Price's death, highlighting his horror film career, but because of its failure to clear copyrights, the show was never aired again. Four years later, A&E produced its updated episode, a show titled Vincent Price: The Versatile Villain, which aired on October 12, 1997. The script was by Lucy Chase Williams, author of The Complete Films of Vincent Price. In early 1991, Tim Burton was developing a personal documentary with the working title Conversations with Vincent, in which interviews with Price were shot at the Vincent Price Gallery, but the project was never completed and was eventually shelved. Price was an Honorary Board Member, and strong supporter until his death, of the Witch's Dungeon Classic Movie Museum located in Bristol, Connecticut. The museum features detailed life-size wax replicas of characters from some of Price's films, including The Fly, The Abominable Dr. Phibes, and The Masque of the Red Death. A black box theater at Price's alma mater, Mary Institute and St. Louis Country Day School, is named after him. Director Tim Burton directed a short stop-motion film as a tribute to Vincent Price called Vincent, about a young boy named Vincent Malloy who is obsessed with the grim and macabre. It is narrated by Price. "Vincent Twice, Vincent Twice" was a parody on Sesame Street. He was parodied in an episode of The Simpsons ("Sunday, Cruddy Sunday"). Price had his own Spitting Image puppet, who was always trying to be "sinister" and lure people into his ghoulish traps, only for his victims to point out all the obvious flaws. Starting in November 2005, featured cast member Bill Hader of the NBC sketch comedy/variety show Saturday Night Live has played Price in a recurring sketch in which Price hosts botched holiday specials filled with celebrities of the 1950s/60s. Other cast members who played Price on SNL include Dan Aykroyd and Michael McKean (who played Price when he hosted a season 10 episode and again when he was hired as a cast member for the 1994–95 season). In 1999, a frank and detailed biography about Price written by his daughter, Victoria, was published by St. Martin's Press. In late May 2011, an event was held by the organization Cinema St. Louis to celebrate what would have been Price's 100th birthday. It included a public event with Victoria at the Missouri History Museum and a showcase of ephemeral and historic items at the gallery inside the Sheldon Concert Hall. Deep Purple's 2013 single "Vincent Price" is dedicated to him. Price was a friend of the band and in 1975 he appeared on Roger Glover's live version of "The Butterfly Ball and the Grasshopper's Feast" as a narrator. 1946 Suspense "The Name of the Beast"
Price, Vincent, I Like What I Know – A Visual Autobiography. Garden City, New York: Doubleday, 1959. Price, Vincent and Price, Mary Grant, A Treasury of Great Recipes. Bernard Geis Associates, 1965; ISBN 1121111130. 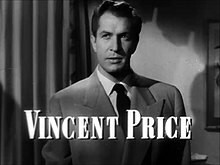 Price, Vincent, The Vincent Price Treasury of American Art. Waukesha, Wisconsin: Country Beautiful Corporation, 1972; ISBN 978-08-7294031-4. 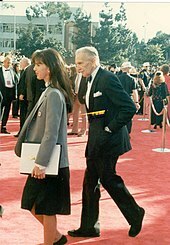 ^ "Vincent Price - Hollywood Star Walk". projects.latimes.com. Retrieved 2017-08-04. ^ McCarthy, Erin (March 28, 2014). "Vincent Price was a Gourmet Cook". Mental Floss. ISSN 1543-4702. OCLC 48211285. ^ "Vincent Price profile at". Filmreference.com. Retrieved November 13, 2008. ^ a b c Victoria Price (1999). Vincent Price: A Daughter's Biography. New York: St. Martin's Griffin. ISBN 978-0312267896. ^ McDonald, Shawn. "Milford Academy - History". Milfordacademy.org. Retrieved November 19, 2017. ^ Price, Victoria (1999). Vincent Price: A Daughter's Biography. St. Martins Press. p. 44. ISBN 978-0312242732. ^ Price, Victoria (1999). Vincent Price: A Daughter's Biography. New York: St. Martin's Press. p. 40. ^ a b c "Vincent Price". Biography.com. Retrieved March 7, 2014. ^ "Victoria Regina cast list". IBDB.com. Retrieved October 19, 2015. ^ "'Victoria Regina' Playbill Facsimile". Performingartsarchive.com. Retrieved March 7, 2014. ^ "Vincent Price profile". Encyclopedia Britannica. Retrieved November 18, 2017. ^ Flint, Peter B. (1993-10-26). "Vincent Price, a Suave but Menacing Film Presence, Is Dead at 82". The New York Times. ISSN 0362-4331. Retrieved 2018-01-18. ^ One Act Virtual Museum, oneact.org; retrieved: May 20, 2012. ^ a b Maçek III, J.C. (October 23, 2013). "Vincent Price: The Poe Cycle". PopMatters. ^ Egan, Thomas, Kate, Sarah (2012). Cult Film Stardom: Offbeat Attractions and Processes of Cultification. Palgrave Macmillan. p. 112. ISBN 978-0230293694. ^ "Vincent Price | American actor". Encyclopedia Britannica. Retrieved 2018-01-18. ^ "Hollywood Squares on June 20, 1980". Hollywood Squares. June 20, 1980. NBC. ^ "Historama". Tombstone, Arizona: Roadside America. Retrieved July 24, 2016. ^ "CH TV Hamilton History". canada.com. Archived from the original on January 29, 2006. Retrieved January 29, 2007. ^ Curran, Colleen. "Poe Museum celebrates Edgar Allan Poe with the International Poe Film Festival". Richmond.com. Richmond Times-Dispatch. Retrieved September 23, 2016. ^ Night of the Wolf details, genome.ch.bbc.co.uk; accessed January 23, 2016. ^ "Silly Vintage Monster Toys". X-Entertainment. Archived from the original on October 6, 2012. Retrieved October 7, 2012. ^ "Watch Vincent, Tim Burton's Animated Tribute to Vincent Price & Edgar Allan Poe (1982)". Open Culture. Retrieved 2017-08-04. ^ Peter Lyle (November 25, 2007). "Michael Jackson's monster smash". Telegraph.co.uk. Telegraph Media Group Limited. Retrieved January 24, 2010. ^ "Overview for Vincent Price". Turner Classic Movies. Retrieved 2018-01-18. ^ "Vincent Price". The New York Times. Retrieved November 18, 2017. ^ Vincent, Alice (2016-12-07). "Edward Scissorhands: 10 things you didn't know about the film that made Johnny Depp a Hollywood star". The Telegraph. ISSN 0307-1235. Retrieved 2018-01-18. ^ Price, Vincent (1959). I Like What I Know : A Visual Autobiography. Garden City, NY: Doubleday & Company. p. 241. ^ "History of the Vincent Price Art Museum". Archived from the original on October 12, 2010. ^ Aug. 1992 interview by the Smithsonian, Siris-archives.si.edu (October 25, 1993); retrieved November 3, 2011. ^ "Sears and Fine Art: Vincent Price Collection of Fine Art", Searsarchives.com; retrieved November 3, 2011. ^ Price, Victoria (1999). Vincent Price: A Daughter's Biography. St. Martins Press. p. 223. ISBN 978-0312242732. ^ "$45,000 painting bought for just $US25", The Australian, August 15, 2008. ^ Price, Victoria (1999). Vincent Price: A Daughter's Biography. St. Martins Press. p. 235. ISBN 978-0312242732. ^ Profile, Vincentprice.org; retrieved October 10, 2012. ^ Price. Wn.com; retrieved November 3, 2011. ^ "The Saint on Old-Time Radio", Saint.org; retrieved November 3, 2011. ^ "Vincent Price On Racism And Religious Prejudice". Youtube. Retrieved 27 May 2018. ^ Price, Victoria (2011-04-01). Vincent Price: A Daughter's Biography. ISBN 9781429979481. Retrieved October 7, 2012. ^ a b murphy, colin (October 25, 2015). "Vincent Price's Daughter Confirms Her Famous Father Was Bisexual". Queerty. Retrieved August 4, 2017. ^ Price, Victoria (1999). Vincent Price: A Daughter's Biography. New York City: St. Martin's Press. p. 305. ISBN 978-0-312-24273-2. ^ Avery, Dan (October 22, 2015). "Vincent Price's Daughter Confirms He Was Bisexual—And A Pretty Awesome Dad". Logo. NewNowNext.com. Retrieved October 23, 2015. ^ Murphy, Colin (October 22, 2015). "Vincent Price's daughter confirms her father's bisexuality". LGBTQNation.com. Boom Magazine. Retrieved October 28, 2015. ^ Hanke, Ken (1999). Tim Burton: an unauthorized biography of the filmmaker (1st ed.). Los Angeles, Calif: Renaissance Books. ISBN 978-1-58063-162-4. ^ "Preserve Hollywood". Preservehollywood.org. Retrieved November 13, 2008. ^ Vincentennial: It's alive! by Joe Williams, Film Critic for the St. Louis Post-Dispatch/STLToday.com, April 18, 2011. ^ Patrick Clark, Sheldon Gallery Celebrates Vincent Price's 100th Birthday, KPLR11.com, April 19, 2011. ^ "Ian Gillan: 'New Song Vincent Price Is Just A Bit Of Fun'". Contactmusic.com. 29 May 2013. Retrieved 16 April 2017. ^ "Escape and Suspense! : Suspense - The Name of the Beast". Escape-suspense.com. Retrieved November 19, 2017. ^ "Theatre Date". Harrisburg Telegraph. October 5, 1946. p. 17. Retrieved October 1, 2015 – via Newspapers.com. ^ "Those Were the Days". Nostalgia Digest. 41 (2): 32–41. Spring 2015. ^ "BBC Radio 4 Extra - The Price of Fear". BBC. ^ The Vincent Price treasury of American art. Worldcat.org. Online Computer Library Center, Inc. 1972. ISBN 9780872940314. Retrieved June 19, 2015. 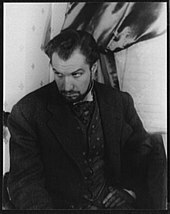 Wikimedia Commons has media related to Vincent Price.